Three new studies from the LBJ School appeared in the leading peer-reviewed journal World Development. The studies explore climate security vulnerability, the relationship between food insecurity and domestic violence, and the long-term effects of political repression on economic performance. Asian countries have among the highest numbers of people at greatest risk of climate-related death. A new study of South and Southeast Asia provides greater understanding of where the hot spots of vulnerability to climate change are located. "Climate change challenges governments around the world to protect their citizens in times of need," said Joshua Busby, the study’s lead researcher and an associate professor of public affairs at the LBJ School. "Not all are equally up the task." 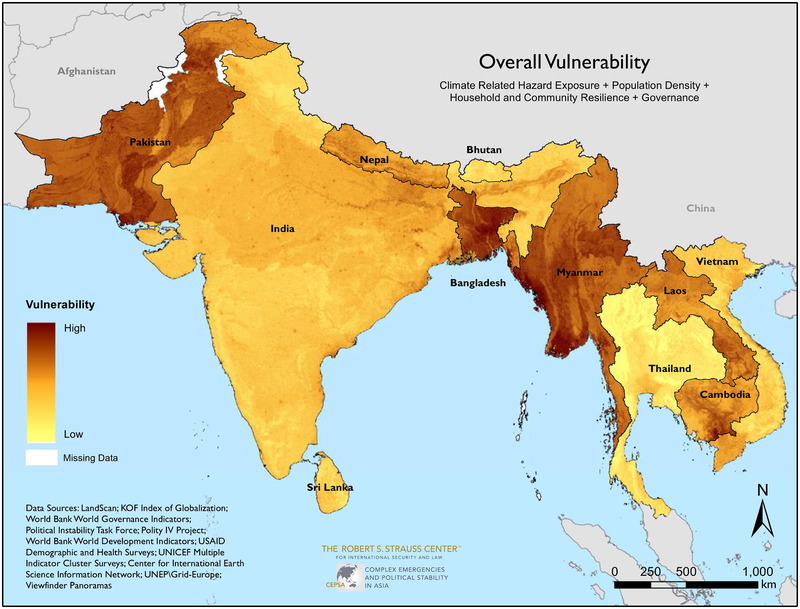 Researchers mapped climate security vulnerability in 11 Asian countries. Climate security vulnerability captures the risk of death from exposure to climate-related hazards and the consequences that follow, including political instability and violent conflict. "This mapping work shows where within countries we should be worried in terms of what climate hazards are present, where people live, what resources they have to protect themselves, and whether their governments are willing and able to help them," Busby explained. "The work shows that much of Bangladesh and parts of Myanmar and Pakistan as most vulnerable in the region." This research was funded by the Department of Defense as part of its "Complex Emergencies and Political Stability in Asia" project. Busby is the principal investigator of this three-year, $1.9 million project. 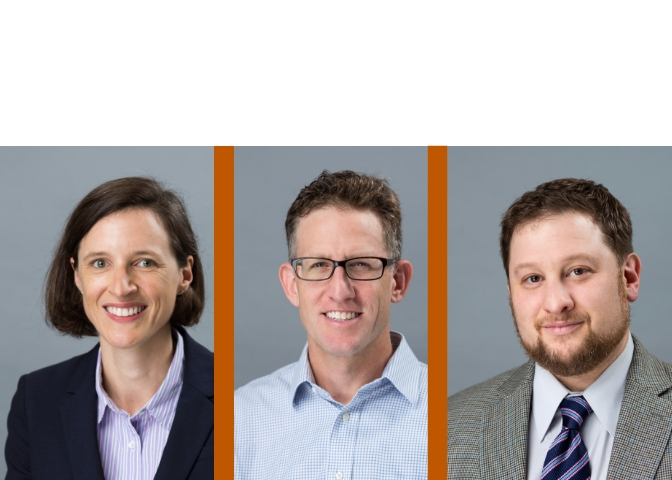 In a first-of-its-kind study, LBJ School Professor Joshua Eisenman demonstrates the long-term economic effects of political repression under authoritarian regimes. Violent political campaigns and loss of human capital result in a decrease in economic output, the study finds. "At a time when liberal intellectuals are under threat around the world, 'The Price of Persecution' demonstrates that abusing them to achieve short-term political objectives has very real long-term consequences for economic growth," Eisenman said. "The lesson is clear for aspiring political leaders of all ethnic backgrounds and political stripes: be good to your skilled workers and your country will be richer." To examine this often-overlooked issue, Eisenman uses an original county-level dataset from Maoist China to demonstrate a negative relationship exists between large-scale, violent political repression of intellectuals in the Anti-Rightist Campaign (ARC) in 1957–58 and economic productivity decades later. During ARC, more than half a million educated Chinese, including university professors and school teachers, were branded as "Rightists" and jailed or exiled to remote labor camps or rural communes. Until at least 2000, significant and robust negative correlations existed between the percentage of victims in a county and its populations' level of educational achievement and economic performance. Researchers added China to a growing body of research on the long-run negative effects of state-sponsored political repression against intellectuals. Many women in rural Bangladesh contend with both hunger and intimate partner violence, according to new research from the LBJ School of Public Affairs. While most studies assume that women living with violent partners have little decision-making power, Erin Lentz, an assistant professor of public affairs, finds that many women instead make choices to help them navigate violence, including choosing to eat less or lower quality foods to avoid violence. "Analyzing interviews with 110 women, I find that several women report eating less in order to avoid violence, prioritizing their physical safety and the well-being of their children before their own nutritional status," Lentz said. "Without explicitly recognizing that the very threat of intimate partner violence is enough to change behaviors, policymakers and practitioners risk misunderstanding the causes of undernutrition." Much of the literature linking violence and nutrition places women living with violence into one of two categories: heroic women who leave and thereby eliminate the risk of violence-related health and nutrition effects, or passive survivors of violence who remain in violent relationships, exposing themselves to hunger and nutritional risk. Understanding the complex trade-offs women make as "burdened decisions" opens the door to broader discussions of the ways that women navigate abuse and make decisions around food practices.